BBC Radio 5 live - Football Daily, Watford fight back to sting Wolves in FA Cup thriller & will Pep leave Man City? Watford fight back to sting Wolves in FA Cup thriller & will Pep leave Man City? 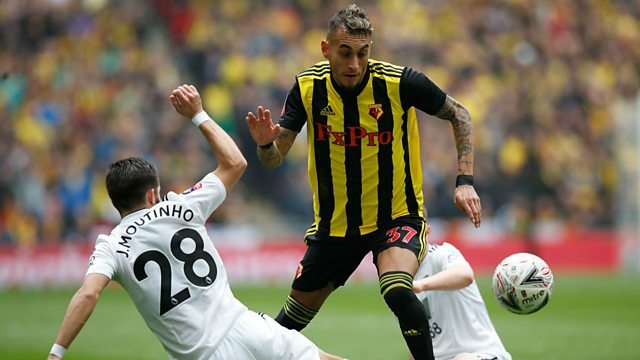 What a thrilling end to the FA Cup semi-final's as Watford came back from two goals to nil, to win 3-2. Jonathan Overend is joined by Michael Brown, Andy Reid and BBC Sport chief football writer Phil McNulty where they discuss Gerard Deulofeu ‘Messi-esque’ two goals against Wolves to help clinch his team’s first FA Cup final since 1984, and marvel in Troy Deeney’s spectacular injury time penalty. Now Watford face Manchester City in the FA Cup final, after Pep Guardiola’s team beat Brighton 1-0 on Saturday. Michael Brown tells the pod that he thinks Guardiola will leave the club if they do the quadruple. Also the guys focus on Arsenal’s 1-0 loss against Everton in the Premier League which saw Mesut Ozil appear to have a ‘coat tantrum’ after losing away from home. Also Liverpool’s incredible fight-back form is discussed after their game against Southampton. And as the Championship hots up the team look at who's likely to get in the play-offs – with Aston Villa favourites with the panel.